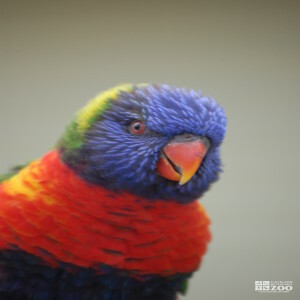 The Australian Rainbow Lorikeet has an overall length of 10 to 12 inches, and weight between 2.5 to 5.5 ounces. Coloration is as follows: Bill, orange to red; Head, blue to deep brown lightly flecked with pale violet; Collar, yellow; Upperparts & Tail, green. The sexes are similar, with the female having a slightly smaller body and a smaller head. They are considered nomadic, their presence being governed by flowering shrubs, particularly in southern parts of the range. Daily movement to offshore islands occurs. They are arboreal and gregarious. The feet are strong, with sharp claws which enable them to climb among clusters of blossoms to seek food. Their tongue is specially adapted for the extraction of nectar from flowers. They move in flocks, often of large size, and are a colorful sight when feeding. Flight is rapid, and they are noisy, constantly screeching and chattering. The range of Australian Rainbow Lorikeet is the Coastal areas of northern, eastern and southeastern Australia. Australian Rainbow Lorikeets inhabit lowland wooded country, including rainforest, mangroves, riparian woodland, and freshwater swamp forest. Australian Rainbow Lorikeets are considered nomadic, their presence being governed by flowering shrubs, particularly in southern parts of the range. Daily movement to offshore islands occurs. They are arboreal and gregarious. The feet are strong, with sharp claws which enable them to climb among clusters of blossoms to seek food. Their tongue is specially adapted for the extraction of nectar from flowers. They move in flocks, often of large size, and are a colorful sight when feeding. Flight is rapid, and they are noisy, constantly screeching and chattering. Some damage is done by these birds to cultivated fruit, and they also attack maize and sorghum crops. Breeding season for Australian Rainbow Lorikeets is August to January. The nest is a deep unlined hole in a limb or trunk of a large tree. Young birds leave the nest in from 7 to 8 weeks.